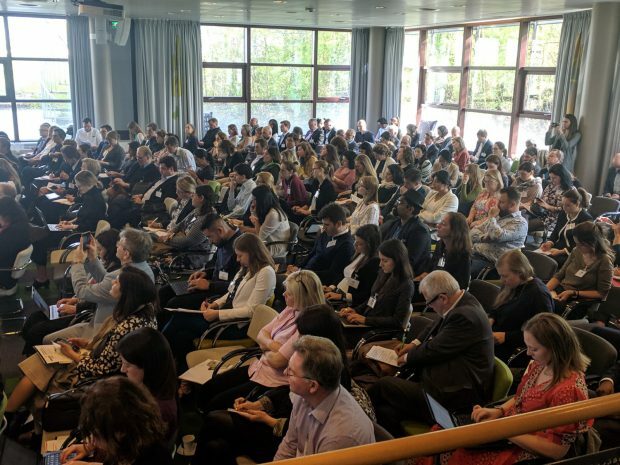 After our recent modern slavery conference in London, I and the team decamped to Amsterdam last week for our sustainable apparel and textiles conference at the Planetarium. It’s a lovely venue. It’s not often you speak on a conference session and a heron flies past the window, as Alison Ward from Cotton Connect, who sponsored the event, noted to me. The conference was under the Chatham House rule so there are limits to what one can report out from it, but it was really very different from our previous events on this subject, which we’ve run since 2014, when we started with cotton, and have broadened out from there. Since the Greenpeace Toxic campaign on chemicals and factories made a big impact five or so years ago, some of the problems that focused campaign covered, have been fixed, or are being fixed. Or are much higher on the agenda. The agenda now is being driven as much by consumer sentiment as by NGOs and campaigns. The two are merging and focusing on trying to stem the flow of ‘over innovation’ in the sector (essentially fast fashion) and looking at new business models, collaborations to tackle the challenges and rethinking approaches. Some more on that below. Setting minimum industry standards is key for the future. Then ‘take out’ those who cannot meet them. Transparency should be seen as a ‘means’ rather than simply as an ‘end’ i.e. a tool for continuous improvement, not just a goal. 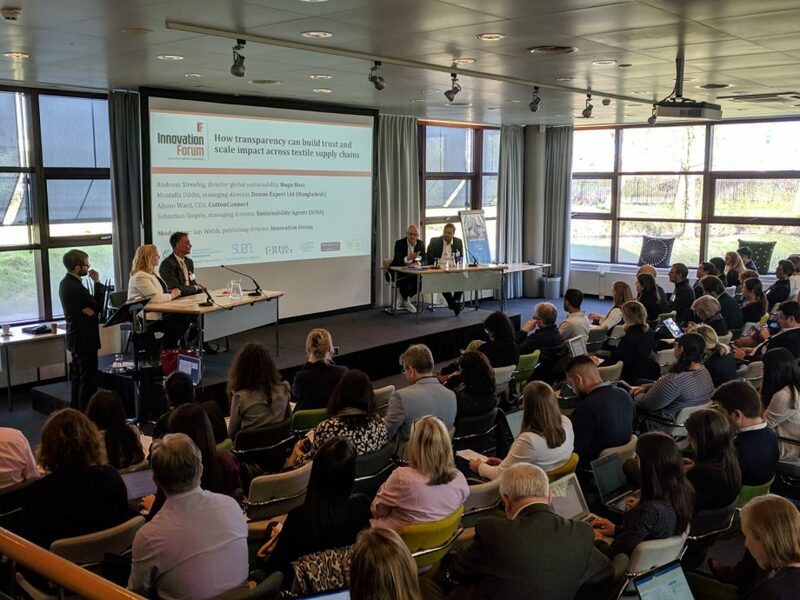 The clothing and apparel sector needs to break out of simple industry silos and think about what it can learn from other sectors, particularly the food sector, where traceability and transparency as tools are driving real change, in places. For consumers, when it comes to circular models, perhaps we should talk more about ‘identity’ rather than circularity. i.e. what consumers identify with (values based approaches, better resource use, better clothing, rather than industry terms such as ‘circular’ or ‘crade to cradle’. “The next/new generation want to wear their values”. Retailers are experimenting with ‘educational’ experiences in-store. Can they learn from others, such as here. Chemical recycling, along with textile recycling (mixed use) is still in its early days but is coming. Many new and existing innovators are focusing on this. Need to change the thinking towards using existing waste resources as ‘new’ sources for materials (abundance of opportunity there) as opposed to landfill or incineration waste. On the above point, how can the industry engage consumers in what can be done with all this post-consumer waste, as a sustainable resource rather than a repetitional millstone around the next of the industry? We should think of consumers as “pro-sumers” who want to be part of the process, from design to life cycle and resource use. Groups such as the Ellen McArthur foundation and the ‘Fashion Circulars’ NY are creating cool campaigns such as “Wear Next” to help enable this shift. At the end of the supply chain, we should start to imagine a new kind of farmer, who grows a crop, and makes textiles from crop, as well as growing food. Mixed land and crop use may be part of the key to the future of smallholders. Plant scientists are working on this today with agronomists. Academic institutions such as Wageningen are keen to collaborate with business on action research and ‘living labs’ in sustainable apparel. “Our style of conferences is all about debate. Taking out boring PPT and corporate videos, we like to focus on debate, discussion and engagement. So what are we trying to achieve here, at this conference, today and tomorrow? What are we trying to achieve here, at this conference, today and tomorrow? Discussion about how we reform the system to take out the biggest inefficiencies and prevent the worst practices in the supply chain. 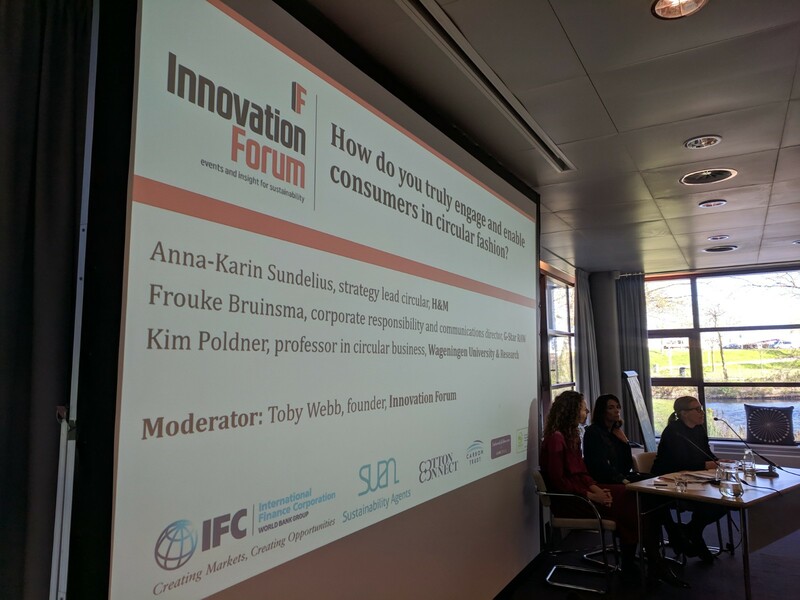 Debate about how we engage consumers about their buying choices, their use of garments and materials and what happens to clothing and textiles after they use them. Conversation about how we turn risk into opportunity. This is the most important point. How can we reframe risk to turn it into something aspirational? Once we’ve taken out the worst practices, can we frame beating up suppliers into helping them become efficient and sustainable businesses? Can we help drive new consumer business models that will lead the industry towards eventual sustainability? Can we close the materials loop and help turn resources we currently waste, into the resources we use next? Looking forward to next year’s conference and hopefully a US version in 2020 too.